Beadware is taking a short hiatus. Regular postings and updates will be on hold until mid-February. In the meantime, peruse previous posts and the slideshow of my wares. See you next month! "Colorplay" earrings $8 each. All have been SOLD. Earrings are $8 All have been SOLD. Earrings are $8. All have been SOLD. Today I added labels to the end of all my posts. This allows you to search for items of like kind. For example if you click on the label earring, all posts with earrings will come up. Or you can search by color, silver or gold, pearls, stones, etc. Have fun! I have mentioned before how much I enjoy making earrings. Because of that I have many, many options for you to choose from! This weeek I will feature a different type of earring in each post. These are made with a triangular shaped teal colored glass bead, with various colored accent beads and a silver coil. Ear wires are silver plated. All are only $8! All have been SOLD. There are so many beautiful kinds of stones to choose from in the bead shops and gem shows. Some I know exactly what I will do with, others I hang onto until an idea comes to me. They become a collection of sorts and can be hard to part with! The stones pictured here are agate. 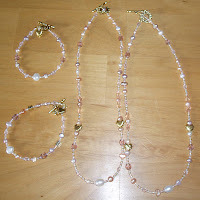 The necklace and earrings pictured have been sold since I placed this post but a second pair of earrings with a small gold coil at the bottom in place of the small stones are still available. All use agate, black seed beads and gold plated accents. Earrings $10. Bracelet $25. All have been SOLD. If you were attending the big event that I am watching on TV today you might have chosen to wear one of these elegant triple strand pearl necklaces. I call them Pink Blush. 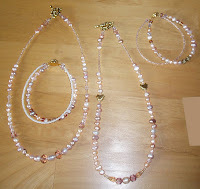 They are a mix of pink dyed and white freshwater pearls, assorted pink, gold, ivory and crystal seed beads, pink and clear Czech crystals and gold plated accents and findings. The necklaces are $45, bracelets $20 and matching earrings are $10 and $8. All have been SOLD. 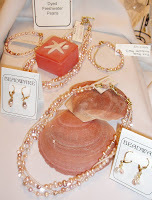 These necklaces and bracelets are a mix of seed beads in shades of pink, pearl and champagne with clear and pink Czech crystals, pink and white freshwater pearls and gold plated accents. The bracelets in the top photo have a gold plated heart dangle. The necklaces are $35 and the bracelets (single or double) are $20. There are also matching earrings (not shown) for $8 and $10. All have been SOLD. These bracelets are not only fun and pretty, but they are indestructible! And there is no clasp to fuss with when putting on or taking off. I wear them when motorcycling or sailing and have ever lost or damaged one. Most are a mixture of size 10 seed beads with larger beads for accents and a decorative dangle on each end. They make 3 wraps around your wrist and come in a myriad of colors. Try wearing several different colors at once! And talk about affordable, most are just $12. Other colors available: Sapphire, Green/gold, Amethyst, Teal, Pastels, Topaz, Autumn Rose, Gold, Red Rainbow, Black/Silver, Black/Gold, and Ocean Blue. Top left picture, from left to right: Bits 'n Pieces (each one is unique and they go with anything! ), Chartreuse and Orange. All $12. Top right picture: Rainbow - matte, multi-colored size 6 seed beads wrapped with red wire. Bracelet $15, earrings $8. Bottom left picture: Orange (5 wraps around your wrist). Bracelets $18, earrings $8. I found these beads at a show in Tacoma and fell in love with them. Porcelain Art Beads from 3C Studio. They are painted and decorated by hand with vibrant colors and a 24K gold or platinum glaze and fired at temperatures of over 1000 degrees. Starting at the 7 o'clock position - this necklace is made with sapphire blue seed beads and blue bugle beads accented with oblong pieces of coral . Moving clockwise, the next necklace is made with copper seed beads, red jasper and gold plated accents. In the 12 o'clock position is a necklace with gold and beige seed beads, bugles and gold plated accents. The next one was my favorite, so it of course has sold! In the 5 o'clock spot is a necklace made with assorted gold and copper seed beads. All the necklaces have gold plated toggle clasps and matching earrings. Necklaces $45, earrings $8 All have been SOLD. You can subscribe to my posts and receive updated content by scrolling down to the bottom of this page and clicking on "Subscribe to: Posts". The process uses something called web feeds. Once you click on the link a window opens. Here you can click on "learn more" for more information on this (as I am definitely no expert!). When you click on "Subscribe to feed" you can then add Beadware to your Favorites Center under feeds. I have seen a subscribe box on some other blogs and I am researching this button to see if this is an easy way for folks to be alerted by email when I make a new post. In the meantime I hope you check in often either by bookmarking my blog or using feeds to see what is new. This necklace is a mix of Periodot chips and black seed beads with a gold plated oak leaf pendant. Necklace $45, matching earrings $8. All have been SOLD. Amethyst is the birthstone for January 20th to February 18th. It is considered a love charm (perfect for your valentine!) and when placed under a pillow brings calm and peaceful sleep. It is given as a symbol of sincerity, security and peace of mind. The necklace on the left is made with Amethyst chips and a few iolite chips for accent along with small silver beads and a silver plated pendant. The necklace on the right is made with Amethyst nuggets and beautiful Bali silver round beads. Necklaces $45, earrings $10. All have been SOLD. When I saw these topaz crystal teardrops I just new they would make gorgeous earrings. They are paired with Czech firepolished crystal round and teardrop beads and gold plated findings. $15 All have been SOLD.